Oh my, what a week! Hope yours was wonderful! Had to power through mine. I get asked all the time how I manage a personal chef business, do a newspaper column every other week (with photography) and keep up a food blog. Sometimes I don’t. This blog is my playtime, but I can’t post as often as I’d like. I also only want to post quality recipes I think you’re going to love. And oh yeah! 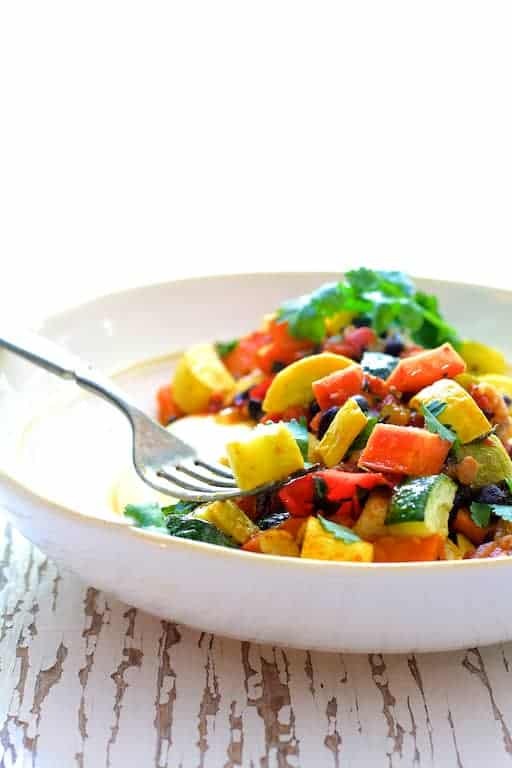 You’re going to love this Spicy Roasted Vegetable and Black Bean Ragout with Polenta, my friend! I made this roasted vegetable ragout last weekend and honestly, lived on it most of the week. It refuses to cool off here so I just haven’t been into anything too heavy and meaty yet. My husband had big corporate stuff going on at work all week with big corporate lunches being catered in so he wasn’t hungry in the evening. I don’t tend to eat a lot while I’m cooking for clients because I’m tasting everything I make. If you don’t have a slight hungry edge throughout the day, you don’t want to taste. However, when I get home, I’m famished! This ragout was wonderful to come home to and perfect for my week. So, “what’s a ragout,” you’re probably wondering. A ragout is simply a French term that refers to a main dish stew. Rather than cooking everything together for a dish like this, I prefer to roast the vegetables separately then add them later so they retain their texture and don’t overcook. I first line my baking sheet with non-stick aluminum foil so that I can use less oil and clean-up is a breeze. This dish would be great with quinoa or brown rice, but is even better with cheesy polenta! And no, you don’t need to stand at the stove and stir. It comes out perfectly in your microwave! The traditional method for making polenta involves slowly adding it to boiling water or stock (so that it doesn’t lump up), then standing at the stove to stir and watch it so it doesn’t burn—all of which takes about 30-40 minutes. Cooking it in the microwave gets it done in minutes. Start with cold water or stock, stir in the polenta, salt, pepper and butter. Cover and cook on high in 4-minute increments and stir between each increment. All microwaves vary in power and wattage (mine is pretty powerful). The polenta is cooked when it’s thick and tender. Then, immediately stir in the cheese and serve. Just in case, here’s everything you ever wanted to know about polenta and ways to cook it from Serious Eats. Okay, I made WAY too much polenta to eat in one sitting. Therefore, before it “set up,” I sprayed an 8 x 8-inch baking dish with nonstick cooking spray and transferred what I wasn’t going to eat to the pan and smoothed it out so it hardened flat. When it cooled, I flipped it out and carefully slid it into a gallon-sized freezer bag and placed it in the freezer. I’m not sure yet what I’m going to do with it so stay tuned! After enjoying it the first time with the polenta, I really didn’t need anything else on the side for my weeknight meals because of the beans and sweet potatoes. 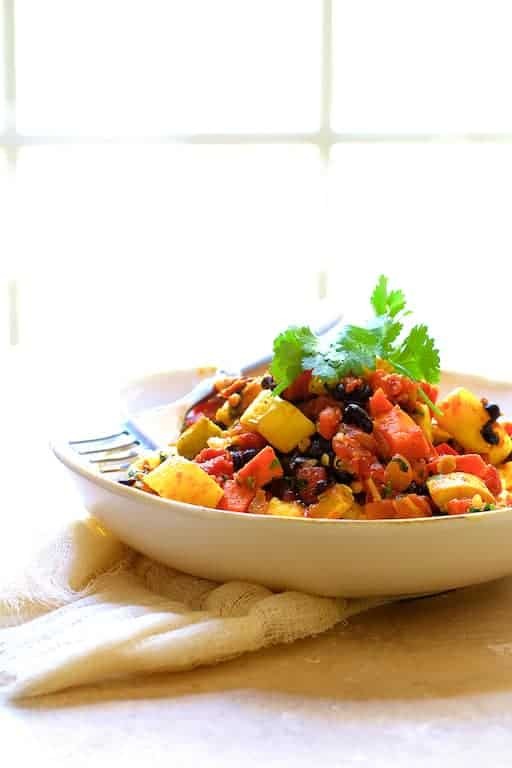 This roasted vegetable ragout could be the filling for tacos, burritos, almost anything! Last night, what I had left became the filling for a quesadilla. Don’t you just love versatile! Enjoy! 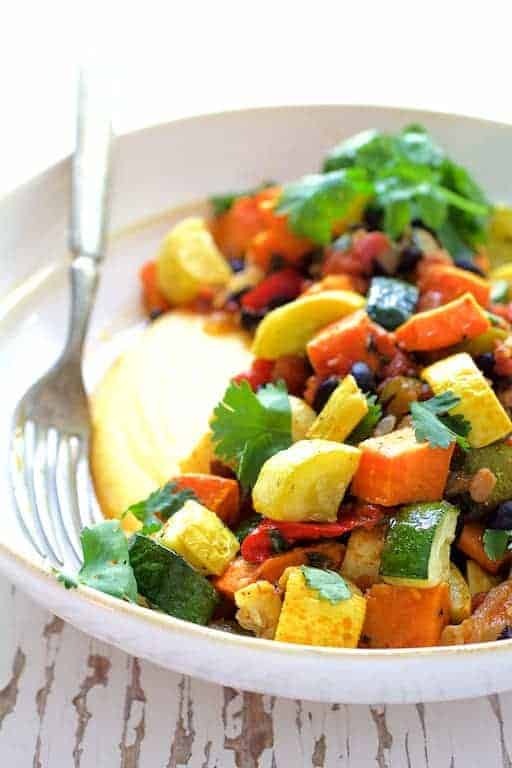 Late summer vegetables, sweet potatoes and black beans in a spicy sauce over creamy, comforting polenta is a hearty and versatile vegetarian dish that satisfies on many levels! Preheat oven to 400 degrees. Line a baking sheet with nonstick aluminum foil. 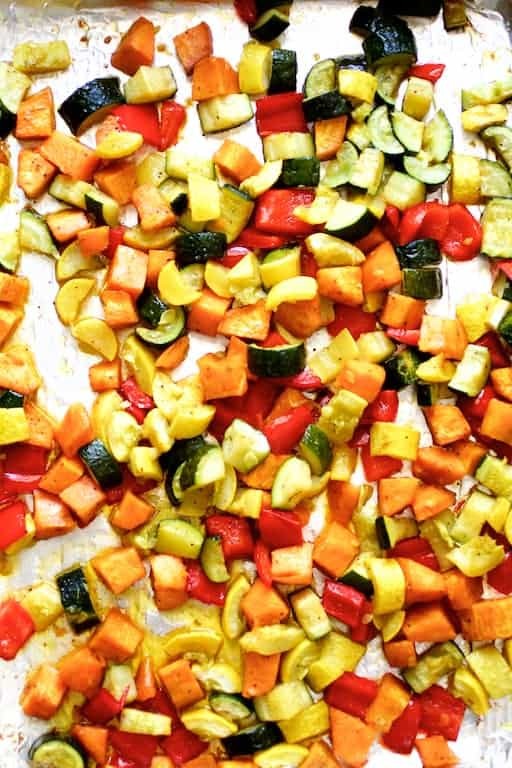 Place zucchini, yellow squash, red bell pepper and sweet potato on the baking sheet and drizzle with 3 tablespoons oil. Season to taste with salt and black pepper. 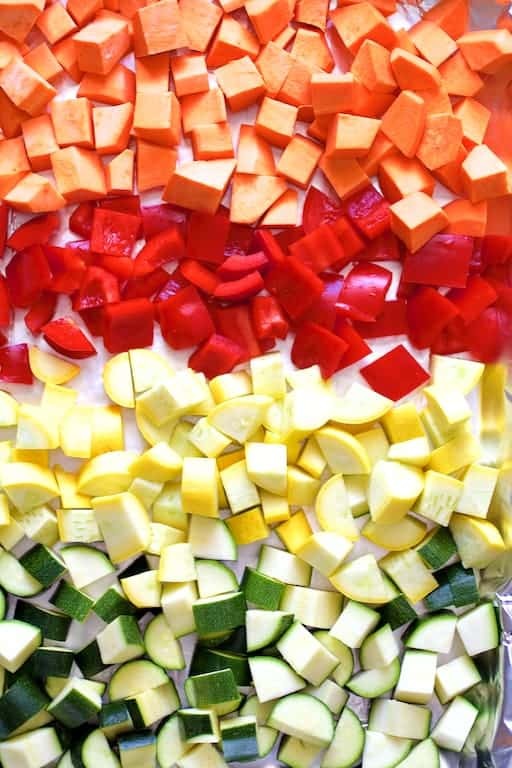 Gently toss so that all the vegetables are coated. Roast 20-25 minutes or until vegetables are tender but not soft. Tilt the pan so that excess oil drains off. While vegetables are roasting, heat remaining oil over medium-high heat in a skillet or saute pan. Add the onion and cook 4-5 minutes or until translucent. Add the garlic, chili powder, cumin, coriander and paprika and stir until garlic is fragrant, approximately 30 seconds. Add tomatoes and vegetable broth. Bring to a boil, reduce heat to low and simmer until thickened to sauce consistency. Stir in black beans and heat through. When vegetables are finished, stir them in and add cilantro. Season to taste with salt and black pepper. 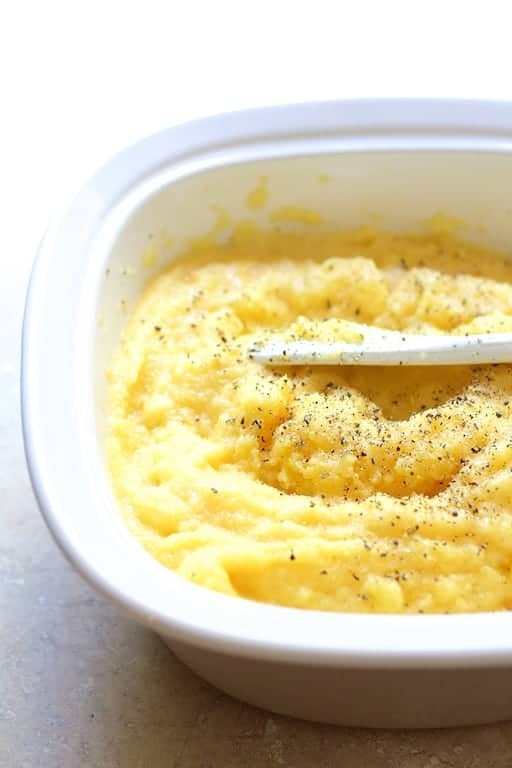 Combine broth, polenta, butter, salt and black pepper in a microwave-safe dish. Cover, place in the microwave and heat on high for 4 minutes. Stir and heat on high another 4 minutes. Repeat if necessary. Immediately stir in cheese and serve with ragout. This is my kind of recipe – rustic and flavorful. Totally making this! Hi, Christine, Thanks so much! Hope you enjoy!